Today, drive to AMBOSELI NATIONAL PARK, best known for spectacular views of Mount Kilimanjaro, the highest mountain in Africa at some 19,341 feet. Enjoy your first GAME DRIVE this afternoon. Today features MORNING & AFTERNOON GAME DRIVES. Amboseli offers you a great opportunity to get close to the mighty elephant. You might also spot Cape buffalo, zebra, wild dog, and more. During the heat of the day, relax at your lodge or camp. Today, fly to Nanyuki (via Nairobi), where you will meet a new Driver/Guide and drive to OL PEJETA CONSERVANCY, the largest black rhino sanctuary in all of East Africa. After lunch, embark on your first GAME DRIVE in search of the “Big 5”—lion, leopard, elephant, rhino, and Cape buffalo. Rise early for a MORNING GAME DRIVE with beautiful Mount Kenya as the backdrop. Beyond the “Big 5,” you may spot cheetah, zebra, gazelle, and more. If you are lucky, you might even spot rare wild dogs. After lunch, enjoy a GAME DRIVE in the conservancy, including a stop at the CHIMP SANCTUARY. In partnership with the Kenya Wildlife Service and the Jane Goodall Institute, the sanctuary was established to provide a long-term home for orphaned and abused chimpanzees. Here, see the chimps and learn more about their plight. A final GAME DRIVE in the conservancy before driving to the Lake Nakuru area. The journey takes you through the beautiful Kenyan highlands, one of the most fertile agricultural areas in all of Africa, where farmers grow crops such as corn, wheat, coffee, and tea. Stop for lunch at Aberdare Country Club. 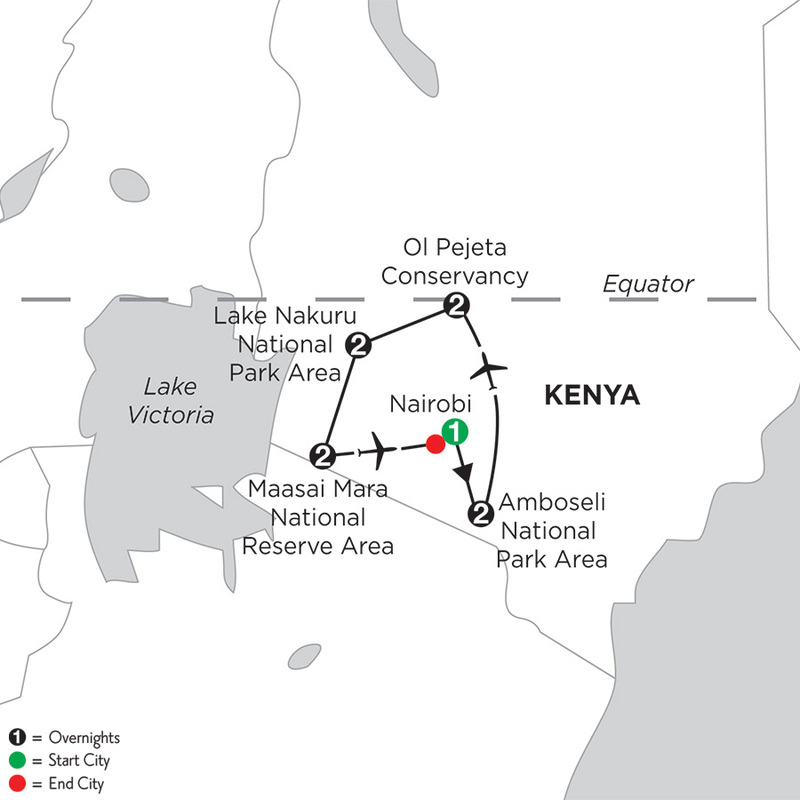 Today, explore LAKE NAKURU NATIONAL PARK during MORNING & AFTERNOON GAME DRIVES. The park is home to a variety of animals including giraffe, impala, Cape buffalo, and striped hyena. This is also your best chance to see white rhino, which are commonly spotted here. Relax at your lodge or camp between game drives. If staying at Lake Elmenteita Serena Camp, you may opt for an afternoon game drive closer to camp in Soysambu Conservancy. Drive to MAASAI MARA NATIONAL RESERVE, Kenya’s most famous game area. Stop for lunch en route before embarking on an AFTERNOON GAME DRIVE. Today, your Driver/Guide pilots you on MORNING & AFTERNOON GAME DRIVES in the “Mara,” as it is called by the locals. Part of the Serengeti ecosystem, the reserve boasts a strong permanent population of game. When the Great Migration of wildebeest and zebra arrives, generally between August and early November, the population enlarges by almost 2 million. This provides a great food source for predators such as lion, leopard, and hyena. This morning, fly back to Nairobi, where your vacation ends. We have reserved a day room at the Ole Sereni Hotel for you to use prior to your homebound flight. Book homebound flights after 5 pm. Between destinations and for all game drives: private safari minibus carries up to six people, and features a pop-up roof for easy game viewing/photography; private transfers to/from airport for all intra-vacation flights; intra-vacation flights and taxes not included. Nestled in 190 acres of wooded Maasai land, the lodge sits on the foothills of Africa's highest mountain, Mt Kilimanjaro. Mature wooded gardens with a variety of trees and plants, from thorn trees and acacias, to fragrant frangipanis, colorful bougainvillea and giant cactus plants thrive in these surroundings. Electricity is provided during limited hours: 4:30 am to 9 am, 1 pm to 2 pm & 6 pm to midnight. 24-hour power may be requested for breathing machines. The rooms are constructed as individual huts, and they are all spacious, with ensuite bathrooms, and verandah. The interior is painted with cream walls and a contrasting ochre color. Local materials like sisal, driftwood, Maasai blanket fabric, canvas, wrought iron, are all used for furnishings, maintaining the African theme. Located in the foothills of Mount Kilimanjaro and surrounded by 190 acres of mature wooded gardens that include everything from thorn trees and acacias to fragrant frangipanis, colorful bougainvillea, and giant cactus. A sheltered oasis clustered around a waterhole and set in the pristine calm of the private Ol Pejeta Conservancy, Sweetwaters Tented Camp offers a charming blend of under-canvas ambiance and safari luxury. The camp lies in the 110,000-acre Ol Pejeta Conservancy, which is situated on the Laikipia Plains, 17 km from Nanyuki and close to Mount Kenya. The camp has 39 tents with solid floors, separate thatched roofs, and ensuite bathrooms. They also feature a writing desk and a verandah with chairs and a table, where you can watch the animals congregate around the waterhole. Wi-Fi access is available. The lodge features excellent service and a warm and relaxed atmosphere that embraces the uniqueness of Lake Nakuru National Park's ecosystem. Electricity is provided 24 hours a day. In the southeast niche of Lake Nakuru National Park with sweeping views of the lake. Stylish rooms feature rustic African furniture, four poster beds, and modern ensuite bathrooms. Set against the magnificent backdrop of Africa's highest mountain, the glittering Mount Kilimanjaro, Amboseli Serena Safari Lodge enjoys a uniquely privileged position at the heart of this world-famous national park. At the center of ""Maasailand"", the lodge's décor reflects the brilliant primary colors and iconic shapes representative of these legendary warriors. At the heart of the lodge, shaded by palm trees, is a free-form swimming pool; to either side of which stretch the rooms. Electricity is provided 24 hours a day. The luxury ensuite rooms are accommodated in two single-story dedicated buildings, which lie to the right and left of the main reception and dining areas. Each tastefully-appointed room features a Maasai-inspired, hand-painted, wall fresco, king-sized bed or luxurious twins, lavish all-encompassing mosquito-curtaining, bathroom (with walk-in shower), writing/vanity unit, and private veranda. Located in the heart of Amboseli National Park, with Kilimanjaro's snow capped peak rising behind it. Tortilis Camp was the first eco-friendly camp in Kenya. With just 16 tents on a hillside the camp was built using local materials, small generators and invertors, and most importantly of all -- employing the majority of its staff from the local Maasai community, the first and still the only camp in Amboseli to do so. The camp takes advantage of the truly spectacular views of Mt. Kilimanjaro, the best views in Amboseli. After a day on safari grab a drink from the bar or take a dip in the outdoor pool. Meals are served at individual tables and feature fresh vegetables grown in the camps own garden. Electricity is provided 24 hours a day. The camp is on the southwestern edge of Amboseli National Park in it's own 30,000 acre private conservancy. Away from the more often visited eastern side of the park it provides a more wild and private experience. With Mt. Kilimanjaro peering down over the entire camp, each of the 16 tents has a glorious view of the mountain. Each tent is built on a raised platform and features an ensuite bathroom, spacious verandah, and writing desk. A sheltered oasis clustered around a water hole and set in the pristine calm of the private Ol Pejeta Conservancy, Sweetwaters Serena Camp offers a charming blend of under-canvas ambiance and safari luxury. The 17 luxury tents in the Morani Wing are the perfect retreat and offer more living space than the standard tents. Tents come complete with a sitting area, writing desk, double closet, and ensuite bathroom with a double vanity and large stand-up shower. Get a good night¿s rest on the comfortable beds and relax on the verandah with views of Mount Kenya and the many animals that visit the nearby waterhole. Sarova Lion Hill Game Lodge is cleverly laid out such that most rooms and sitting areas afford stunning views of Lake Nakuru. The Lodge incorporates natural landscaping with tall acacia trees, winding walkways and greens dotted with bird feeds. The Lodge is a natural haven for bird life and attracts over 50 species of birds. Electricity is provided 24 hours a day. Nestled on Lion Hill in the heart of Lake Nakuru National Park with panoramic views of Lake Nakuru. Sarova Lion Hill Game Lodge has 67 luxury chalets. Each chalet offers private patios with panoramic views of the flamingo pink rimmed Lake Nakuru, ensuite bathrooms with permanent showers and WC, running hot and cold water, razor outlets with 220 and 240 volts beds with mosquito nets, hair dryer and tea/coffee making facilities. Lake Elmenteita Serena Camp offers traditional safari luxury with 24 spacious tents. It is an oasis of comfort and excellent service situated strategically on a cliff near Lake Elmenteita in Soysambu Conservancy. The conservancy has been identified as a Ramsar Site, a wetland of international importance. The lake is an important stop for over 350 bird species including lesser flamingos. Electricity is provided 24 hours a day. The camp is situated on the shores of sapphire-blue Lake Elmenteita, approximately 30 km from Lake Nakuru National Park. All 24 luxury tents have views of the lake and are each tent is tastefully furnished with its own private veranda. Tent facilities include telephone, wireless internet, mini-bar and electronic safe. 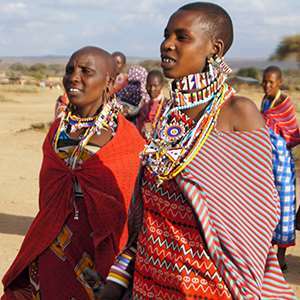 Learn more about this semi-nomadic tribe, famous for herding cattle and their distinctive red clothing.